Mike SANDE enjoying his conference “commute” on an URB-E at SOLIDWORKS World 2018. 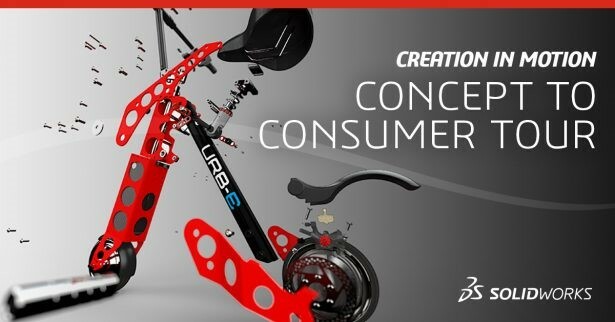 URB-E was on-site this year at SOLIDWORKS World to share its story and its epic rideables in the Partner Pavilion. We got to know more about them and how its product was born. URB-E is a story of Concept to Consumer: a rapid scale-up from a zippy electric scooter startup to crowdfunding success to victory at CES 2017 — they won a ‘best Rideable’ award! Cut production costs: This is crucial for companies like URB-E in order to expand the base of addressable customers through lower price points and maximize margins to fuel growth. Streamline production/partner collaboration: If URB-E can cut out cycles with vendors, they can not only reduce cost, but also shorten time to market, and increase operational efficiency in the long run. Respond to (and create value from) the rise of consumer power: Consumers are empowered more than ever with their ability to research, purchase, and review anything online. How can URB-E use that to their advantage? Continually innovate and differentiate to keep winning: When consumers search online, there are dozens or hundreds of offerings for any category. How does URB-E stand out in a heavily competitive market? Thanks to Mike (and URB-E for its generosity in spending time with us! ), we got to know a lot about the team over at URB-E and it became clear: we MUST tell their story! So, this summer, a cast of SOLIDWORKS technical managers will be hitting the road in a first-ever “Concept to Consumer Tour.” Think of this event like a demo of almost a dozen SOLIDWORKS products and how they can work together to enable rapid product development. If you’re new to SOLIDWORKS or leading a team, this is a great chance to witness one of our core workflows across almost our entire portfolio. Being a design leader means driving efficient development process, fast concept evaluation, drawingless manufacturing deliverables, stunning media and consumables, online marketplaces, and seamless process and project management. And, that means pushing your CAD tools and deliverables to the limit. I am excited to dive deep into the world of URB-E as it scales up for full production in Pasadena, California, and strategizes on what’s next for its offerings, its CAD tools, and its business model. At this event, I get to fill the roll of project manager and emcee. In the coming weeks, expect to hear from my fellow SOLIDWORKS team members, in character, as they respond to the mounting competitive pressures! Check out our event page to learn more about the team and the event! PS: Even if you aren’t located in the first round of cities, PLEASE sign up so we can include you in the digital event or future events. Click on the image below for more information. Brian is a 15-year, expert SOLIDWORKS CAD, FEA, and CFD user and community advocate. His interests include engineering, simulation, team leadership, and predictive analytics. Brian holds a BS in Aerospace Engineering and an MBA in Data Science.